I, along with I'm Reading Comeeks, also attended the Autoptic festival on Saturday, and I will be posting my own reaction here soon! I went to the Autoptic comic/zine/art festival Saturday before work. I wish I could have stayed for the whole thing, but the brief time I was able to walk around was awesome. I got to listen to a moderated conversation with Gabrielle Bell and Jillian Tamaki, but had to leave before I could talk with them or have my book signed, which was a bummer. However, luckily my brother was also there, so he got my nice new copy of SuperMutant Magic Academy signed to me from Jillian Tamaki (Yay!) 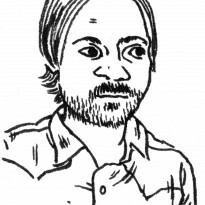 and had our portraits drawn by Gabrielle Bell (awesome!). It was really great to hear them talk about comics, their lives and thoughts about the Indie comic scene. All the artists and writers at the show were super friendly and it was cool to be able to buy their books right there and of course, have them all draw little cartoons in the front and sign the books too! 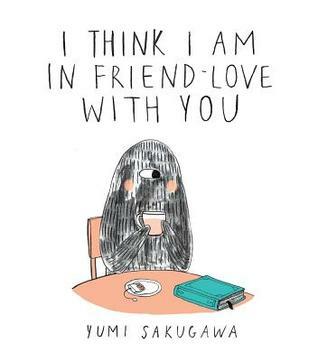 I also bought a comic called, I Think I Am in Friend-Love with You, by Yumi Sakugawa, who was very nice and drew a really cute illustration in the front of the book for me. It's a really adorable comic, with awesome words in between the beautiful illustrations. It would be a great present for besties, or people with whom one is in friend-love. I'll definitely look for more illustrations and comics by Sakugawa. I also got a couple shorter comics, one called Ce/Ze by Suzette Smith. It's about two school girls who believe themselves to be not quite of this world. It reminded me a bit of kids I knew at school and the time at camp when a bunch of girls decided to play those creepy feather, rock whatever games, which they played for all of two minutes before our camp Councillor came back to the cabin and made everyone stop and pray for Jesus to come into our hearts, since apparently playing those games is like speaking to Satan himself or something. Crazy Evangelical camp. The other I bought was a very short, but extremely creepy comic called, "The Thing Outside" by Alex D. Araiza. It was also very nostalgic for me. I remember times when you'd fall asleep watching t.v. with your brother or something, then wake up alone. That was the worst! Then looking at the darkness outside the lit up house, I would imagine all sorts of things living out in that black void. It also really reminded me of a story in one of the Stories to Tell in the Dark series where two girls go swimming and barely escape these evil drowning victims who want them to join them in the depths...the ending of that will stick with me forever and Araiza did a great job evoking the same feelings in this short comic. There were other comics/zines that my brother bought that I'll talk about in another post.